W Photo at Walgreens has been full of great photo deals lately! 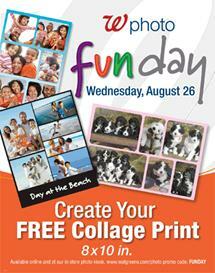 Today only (8/26), get a FREE 8×10 collage print! Use promo code: FUNDAY at checkout. You can also get a free 8X8 photo book at SNAPFISH(20 pages-just pay tax & shipping)TODAY ONLY (a $29.99 value). Enter “SUMMERBOOK” at checkout. Thanks so much for the information on all the photo deals. I just ordered a collage print of various pictures from our beach vacations over the year. It will be a free gift for my daughter for her birthday in September. Free is good! Thanks, Marcy! Just finished up a free Shutterfly book, so I had pictures easily available. Whipped this collage out in no time!